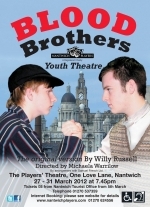 Willy Russell originally wrote Blood Brothers as a school play back in 1991, in conjunction with Merseyside Young People's Theatre. The story is a contemporary one of nature versus nurture, revolving around fraternal twins who were separated at birth. The twins' different backgrounds take them to opposite ends of the social spectrum, resulting in tragedy. Directed by Michaela Warrilow, this is sure to be another vibrant Youth Theatre production and tickets are sure to sell quickly.